The game of Kabaddi has evolved continuously over the past few years. With the advent of the Pro Kabaddi League, the evolution has become more rapid than ever before. This continuous evolution has not been accompanied by a parallel evolution in the tools for measuring performances, which have lagged behind significantly. The traditional metrics – raid points, tackle points, high 5s and super 10s – don’t always convey the entire picture. Kabaddi needs a more evolved and a more nuanced system which adds more meaning to the numbers by measuring the net impact they have on the game. The existing metrics evaluate players based on the number of points that they score; placing no emphasis on the number of raids that they used to score those points. 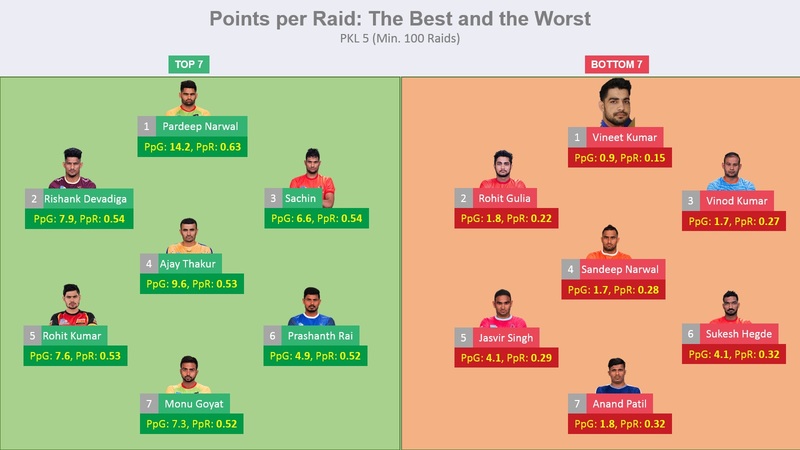 This article is an attempt to improve the evaluation of raids in Kabaddi through a set of more meaningful metrics that give more importance to the constraints that a raiding team operates within and the net effect a raid has. In Kabaddi, the biggest currency for a raiding team is the number of raids that they have. On average, a team gets to do about 44 raids per PKL game. The number of raids a team gets is roughly constant across games and seasons. This implies that the number of raid points scored by a team depends on how effectively a team is able to use these raids. Players completing maximum raids are also expected to score maximum points. Hence, the metric ‘raid points per game’ is biased towards the players who complete more raids. As expected, Pardeep Narwal has completed the highest number of raids in the season showing that he is way ahead of his compatriots when it comes to his fitness levels. He completes more than 22 raids per game which is half the raids of his team. All players on the list lead the raiding departments of their teams and are responsible for 30-45% of the team’s raids. According to our initial assumption that the players completing more raids will also score more points, we expect the same players to be on the list of the top point scorers as well. Table 2 shows the list of players who scored the highest raid points during PKL 5. 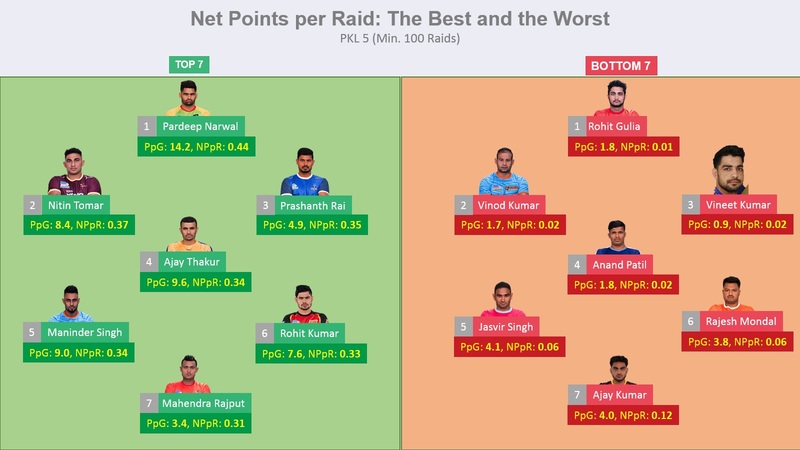 Again, Pardeep Narwal is far ahead of the pack in both raid points as well as raid points per game. The lead that he maintains at the top of the table is testament to his skill. This list is pretty similar to the list in table 1 proving our assumption that raid points and raids go hand in hand. Therefore, raid points per game is insufficient to evaluate the raiding quality of a player. To measure how effectively a raider uses the raids, we propose the use of a new metric called ‘Points per Raid (PpR)’. This is a simple division of the raid points by the number of raids a player undertakes. This metric puts an emphasis on effectively using the raids. The higher the PpR, the better is the usage of raids. Theoretically, PpR can range from anywhere between 0 (no successful raids) to 7 (all opposition players captured during all raids). Practically, not all raids lead to a player capture and a very small proportion include multiple player captures. In PKL 5 as a whole, PpR was 0.41. Before we decide what a good PpR value would be, let us have a look at image 1 which shows the players with the highest and lowest PpR values. As usual, Pardeep Narwal tops another list with his astronomical figures. His PpR of 0.63 means that he gets 63 points for every 100 raids that he undertakes. Like the previous metric, Pardeep stands far ahead of the next best raiders (Rishank Devadiga and Sachin). This graphic also shows that PpR above 0.5 is indicative of a very good raider while that below 0.35 can be considered mediocre. Gujarat Fortunegiants duo Sachin and Mahendra Rajput rank within the top 10 on the basis of PpR which confirms that the Fortunegiants had an efficient offensive unit to back their mean defence. 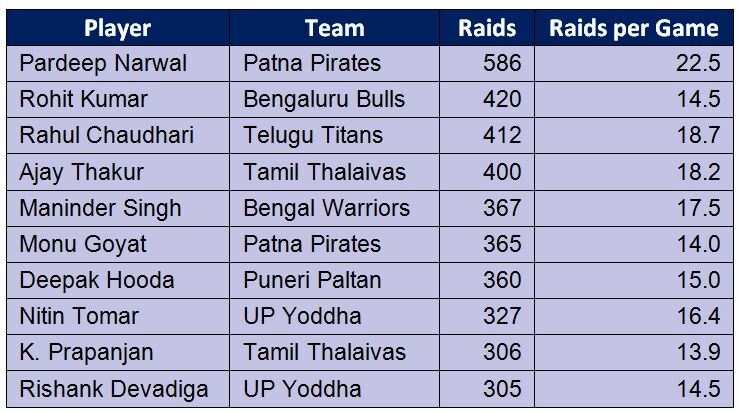 Raiders like Prashanth Kumar Rai (Haryana Steelers) and Surender Singh (UP Yoddha) have low raids per game but high PpR. If these players were given more chances in attack, they could have bolstered their team’s offensive efficiency up a notch. Dabang Delhi has three players (Anand Patil: 0.32, Meraj Sheykh: 0.33, Abofazl: 0.39) at the bottom end of this list. This justifies their performance in PKL 5. Gujarat Fortunegiants have two raiders on this list as well. Both Rohit Gulia and Sukesh Hegde have an exceptionally high proportion of empty raids. This could be a well-executed tactic from the Gujarat Fortunegiants. Once again, Pardeep Narwal tops the list with an NPpR of 0.44. This means that, for every 100 raids that Pardeep Narwal undertakes, he creates a 44 point positive differential for Patna Pirates. Nitin Tomar, who wasn’t on the list of top 10 raiders by PpR is second on NPpR. He created a 37 point positive differential for UP Yoddhas every 100 raids that he undertook. Prashanth Rai and Mahendra Rajput are surprise entries on this list. More opportunities to these players could have been a very good boost for the team. Looking at the bottom 7 raiders based on NPpR, we see that raiders like Rohit Gulia, Vinod Kumar, Vineet Kumar and Anand Patil have negligible impact on the point differential. We also have stalwarts like Jasvir Singh (Jaipur Pink Panthers) and Ajay Kumar (Bengaluru Bulls) on the list. Their teams could have been better off with fewer raids from them. All in all, this is a slightly advanced metric to assess raiders. Based on PKL 5, we see Pardeep Narwal and Nitin Tomar leading the surprise entry Prashanth Kumar Rai on the top. The same metric can be aggregated to a team level to assess which teams use raiding more efficiently. The Patna Pirates (0.34), led by Pardeep Narwal and Monu Goyat lead UP Yoddhas (0.24) on the list. Jaipur Pink Panthers (0.12) and Dabang Delhi (0.13) stand at the bottom of the pile. P.S. With availability of data for super raids, the ‘# failed raids’ component of NPpR calculation can be replaced by ‘points given away’. That will make this metric more robust. We will soon publish a similar analysis for Defensive contribution. In the meantime, please feel free to share any thoughts and/or suggestions on this. This entry was posted in Kabaddi and tagged Kabaddi, PKL, Pro Kabaddi, Pro Kabaddi Auction, SportsKPI. Bookmark the permalink.